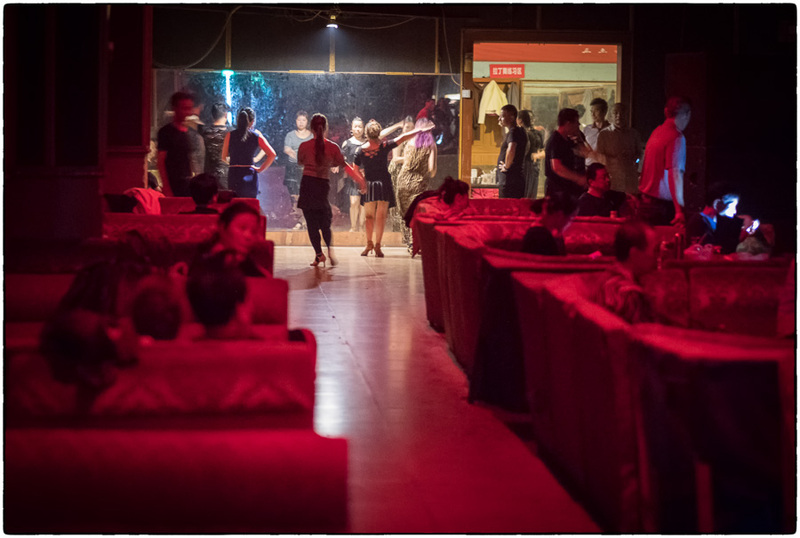 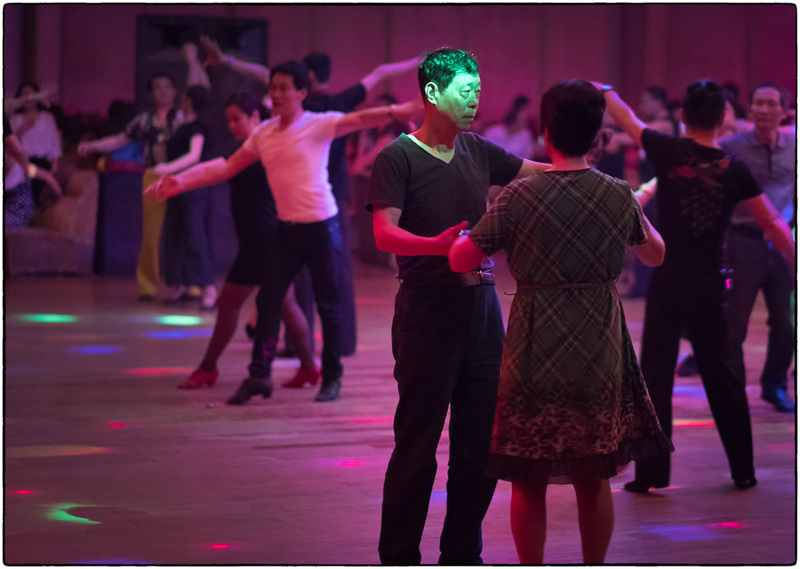 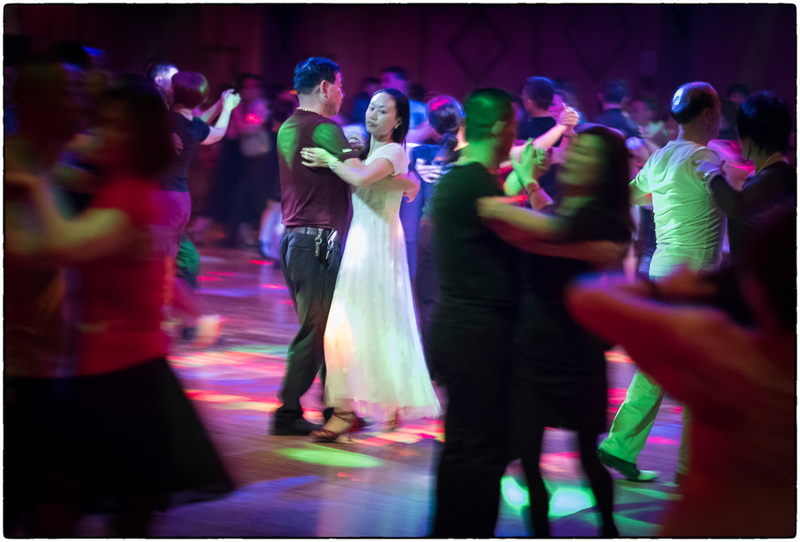 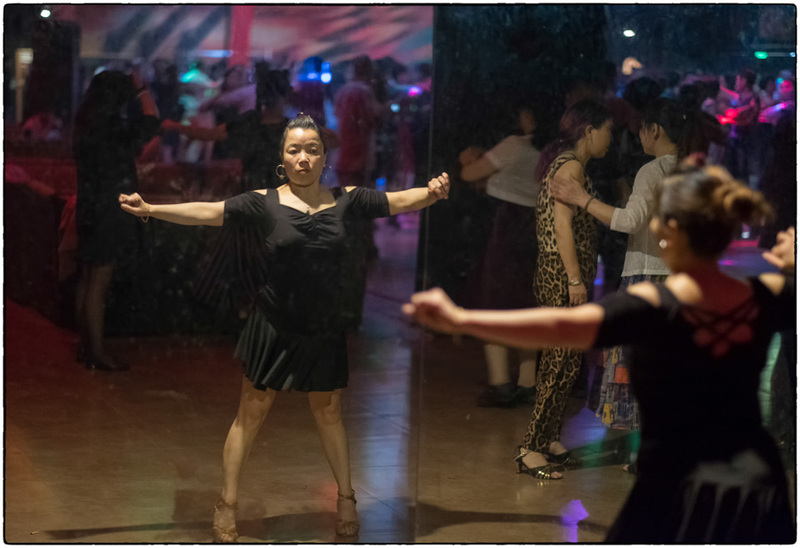 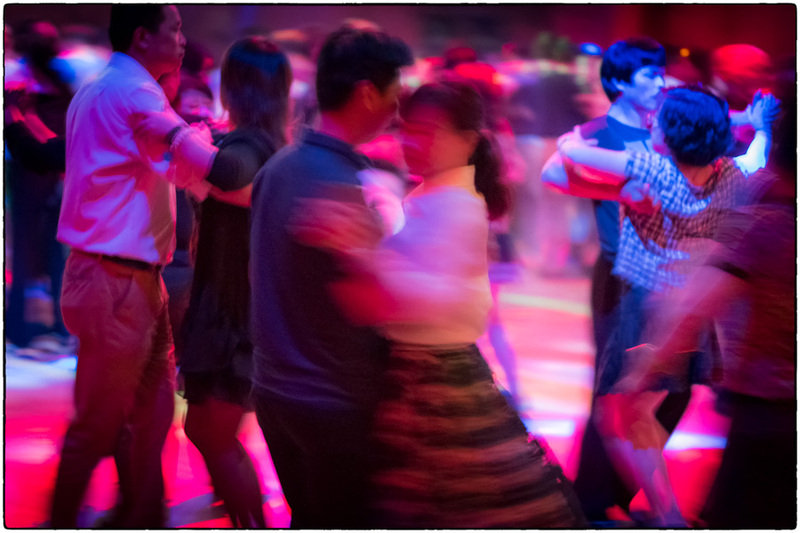 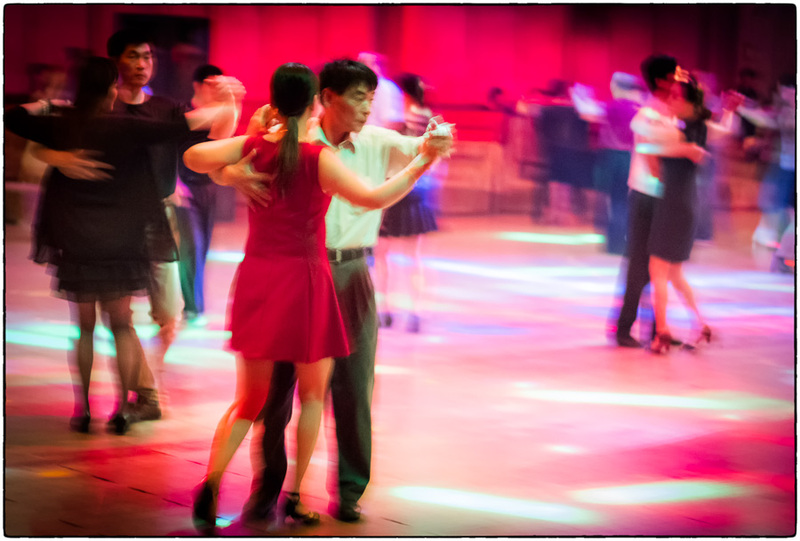 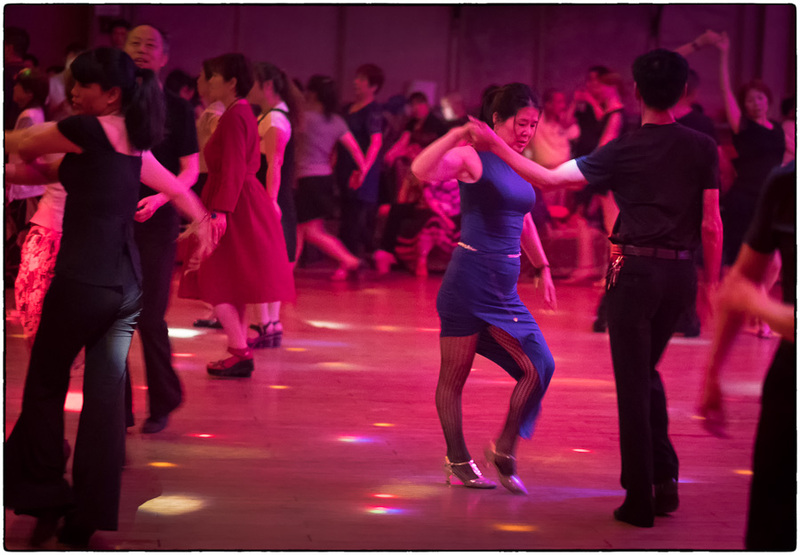 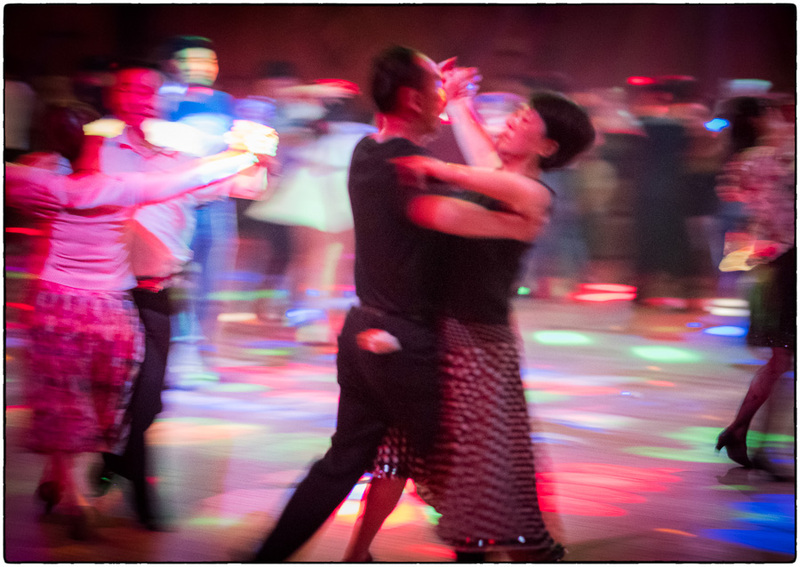 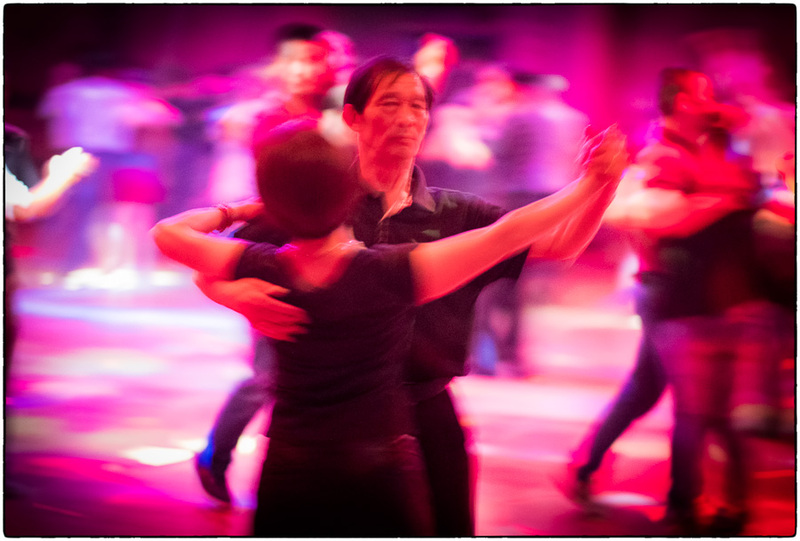 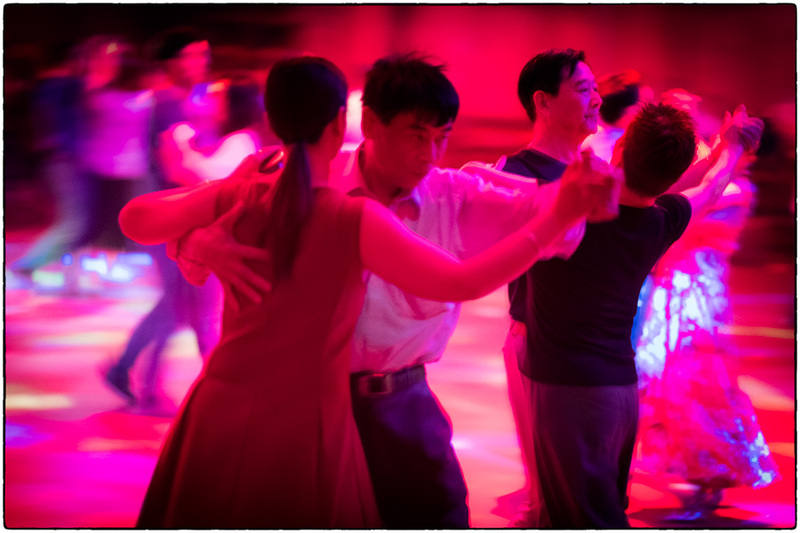 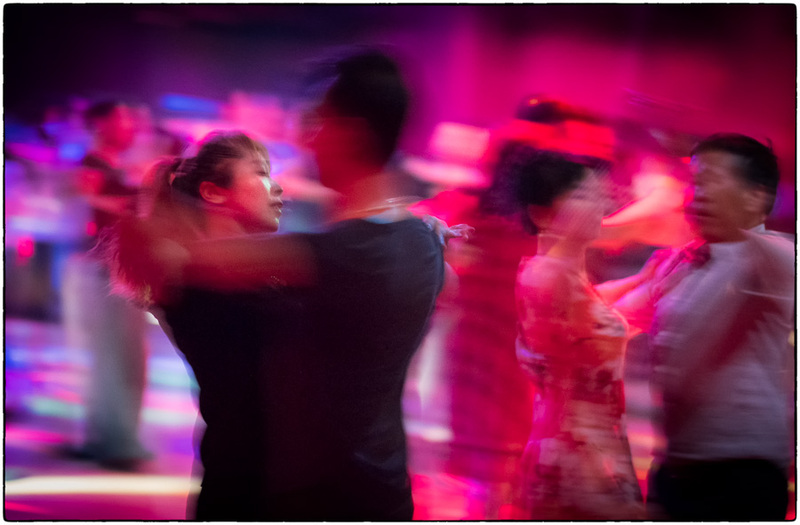 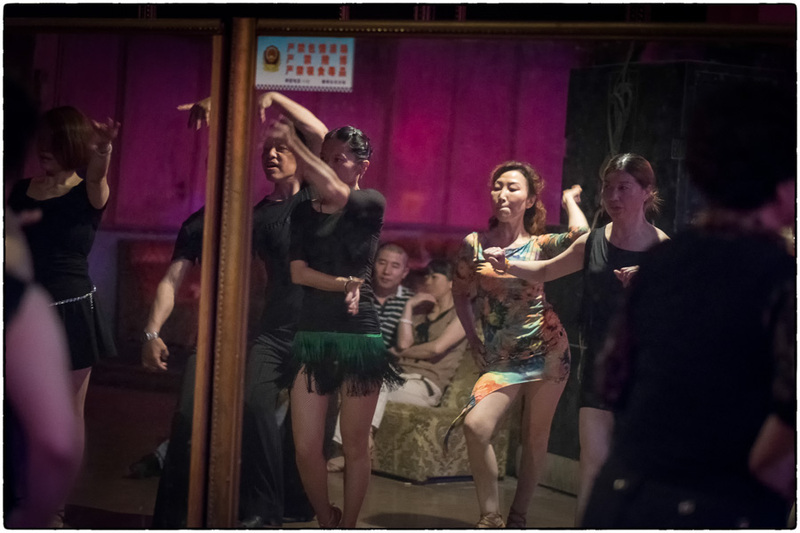 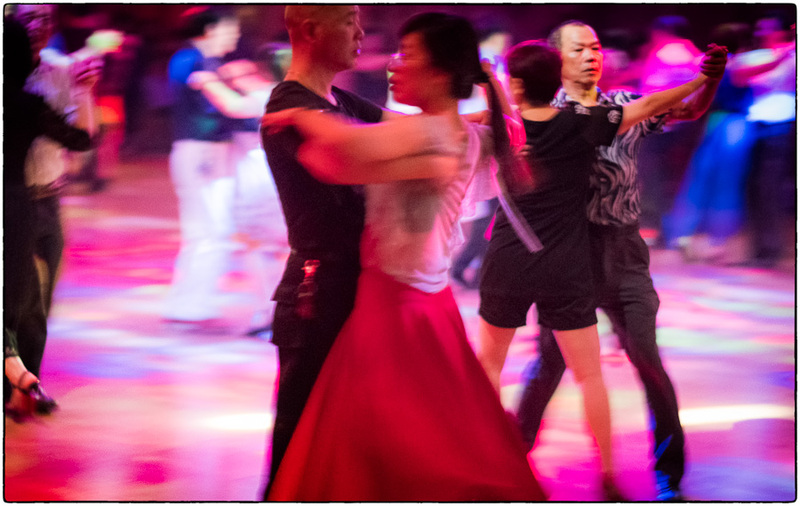 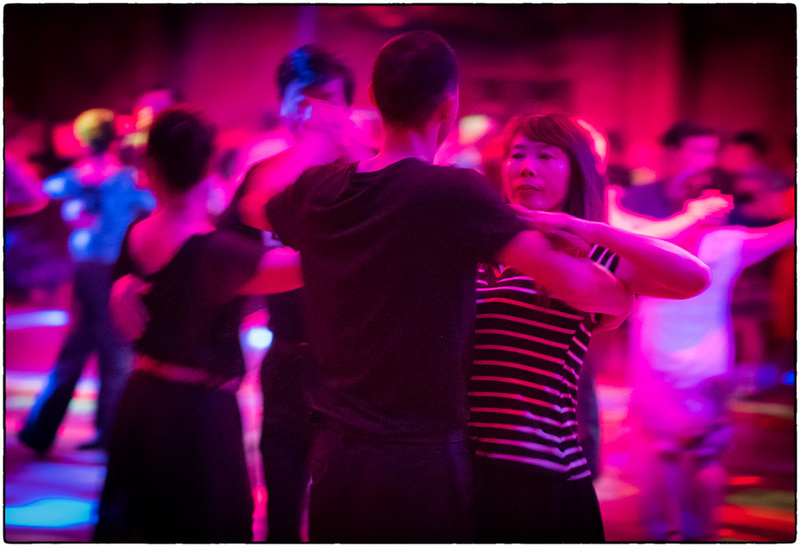 I had the opportunity to photograph some ballroom dancing in China on this trip, but it didn’t quite turn out like I thought it would. 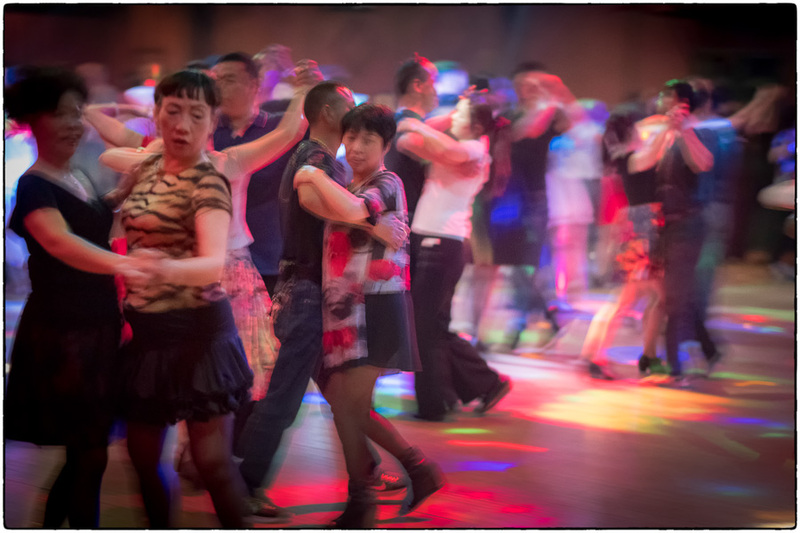 I discovered that groups of middle-aged Chinese people meet at 7:00am on Sunday mornings to dance in huge ballrooms (more like a nightclub). 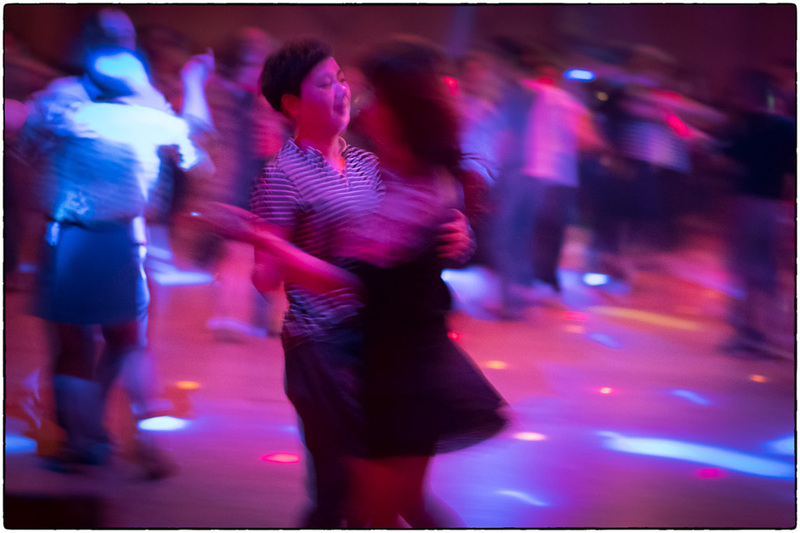 When I walked in my heart sank – the room was nearly pitch black with only a few blinking “disco lights” in the middle of the ceiling. 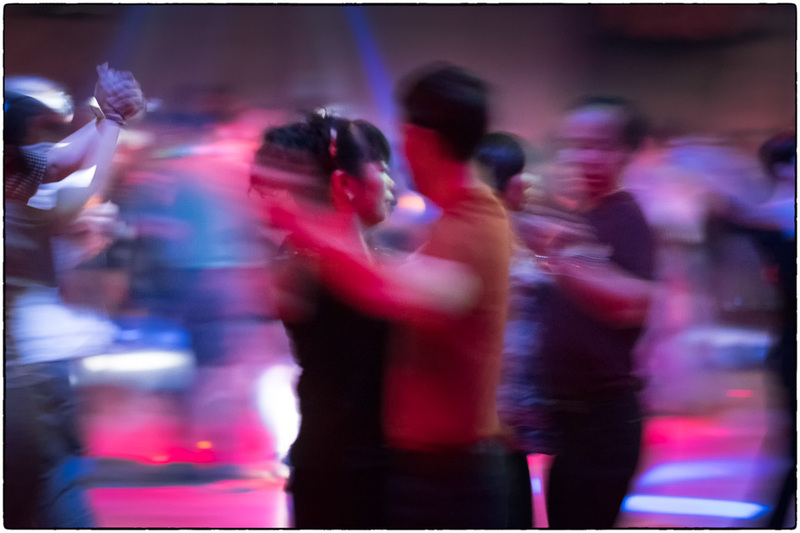 I tried a few test shots and came to the realization that I would need to switch from my normal razor-sharp focused documentary style of photography to something more stylized. 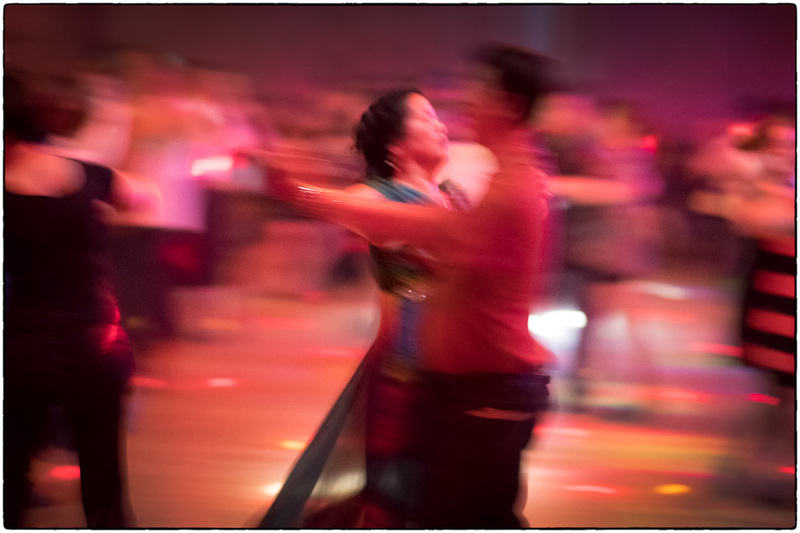 I cranked up the ISO (8,000) and dropped the shutter speed to a very slow 1/8th of a second to produce some dreamy-looking pan shots. 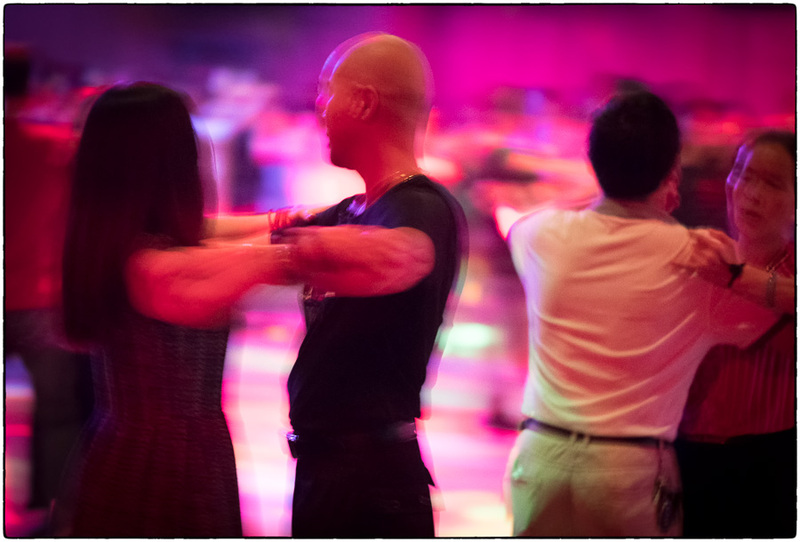 Because it was so dark I also shot wide open at f1.2 on the Fujinon 56mm lens. 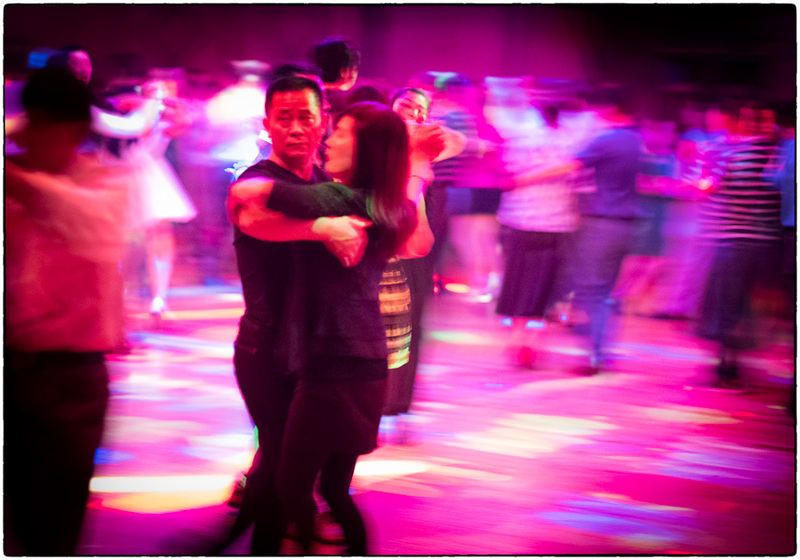 The 56mm is a legendary lens in the Fuji collection but is notoriously bad at focusing in low light, so I spent a lot of time trying to nail focus when the lights got brighter. 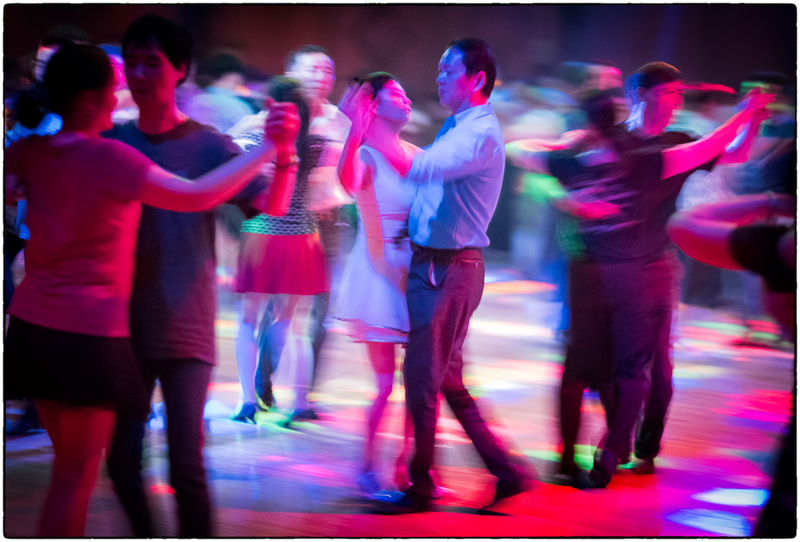 The “double exposure” effect on some photos is from the lights blinking twice during the 1/8 second exposure. 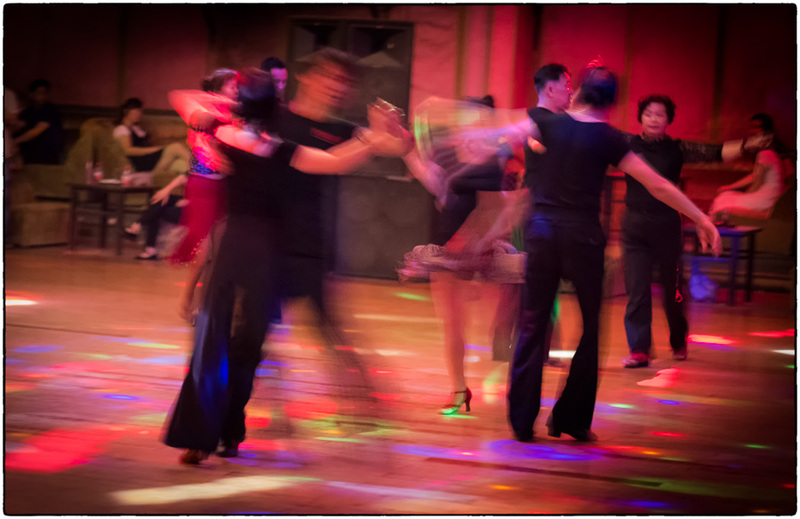 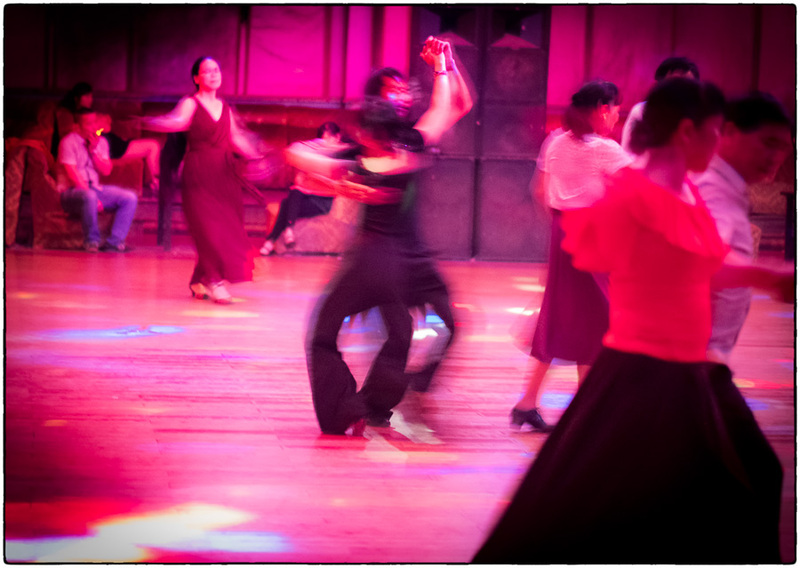 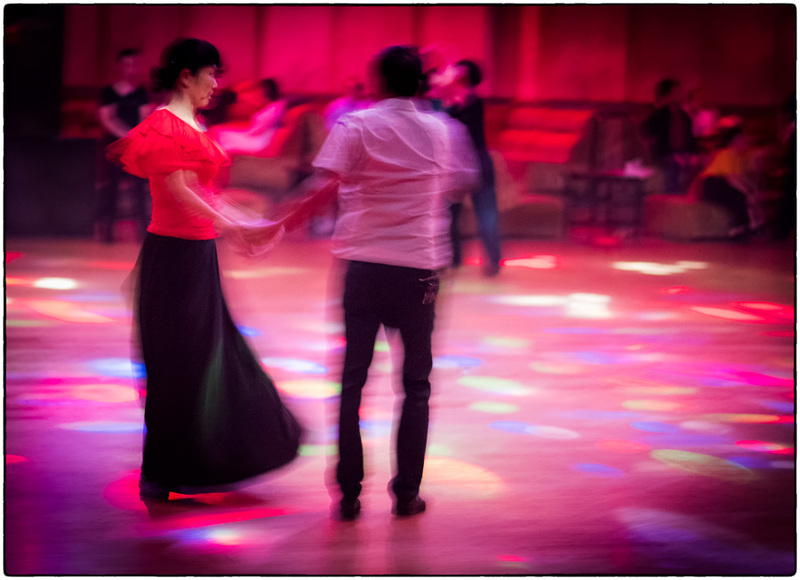 I think the blurred images do a nice job of conveying the dancing movement in the room. 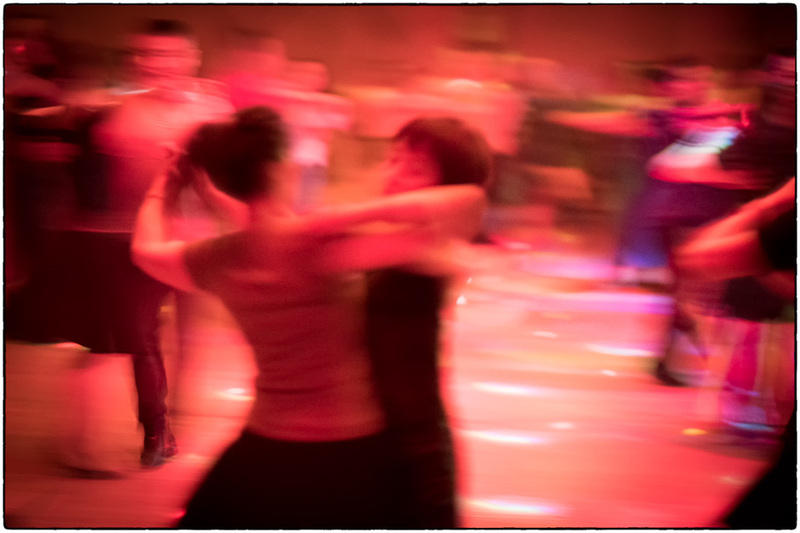 As I photographed the dimly lite room full of amateur dancers I imagined the darkened room was not unlike the massive audio reverb used in karaoke singing to mask bad singing skills. 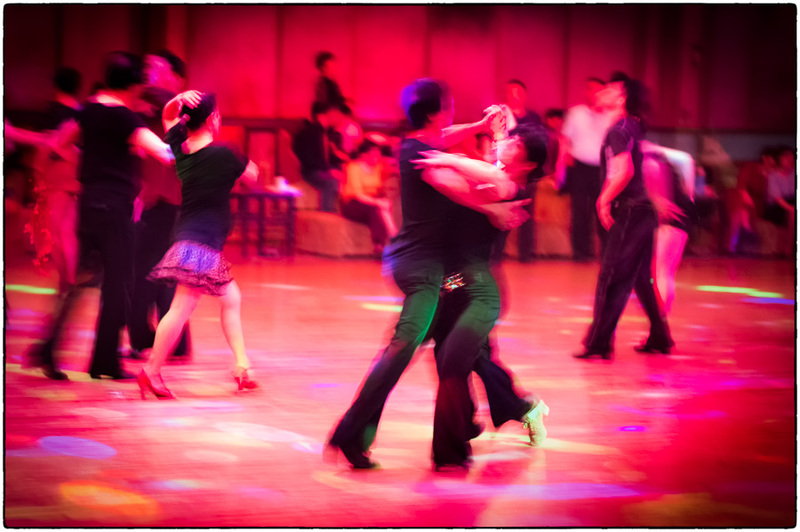 Here in the dark everyone was suddenly Fred Astaire and Ginger Rogers. 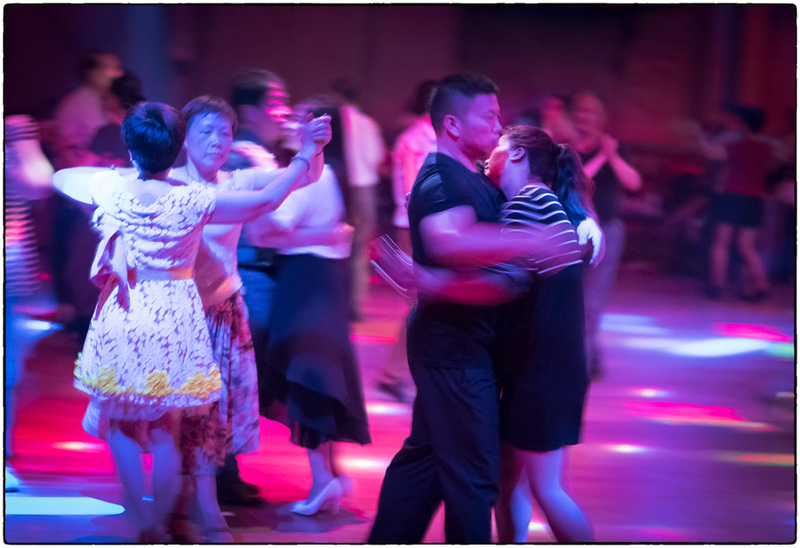 I also put the photos together in a short mash-up video with music. 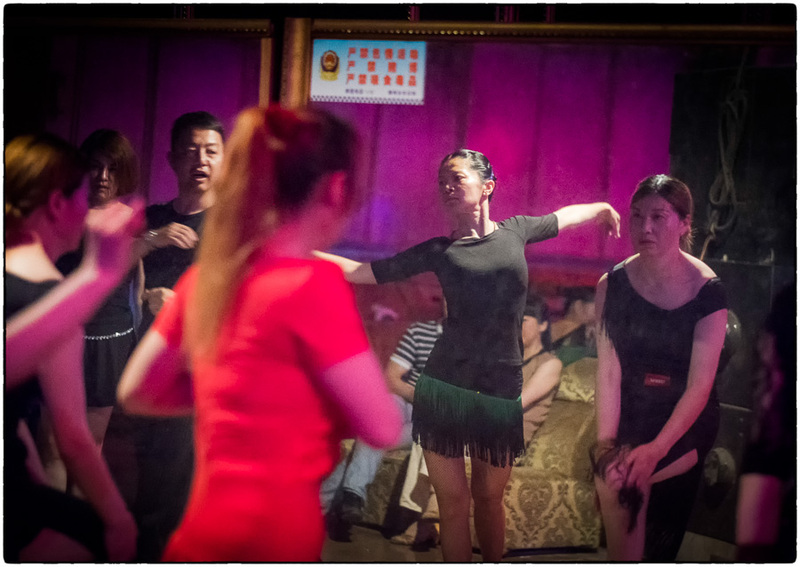 May 21, 2017 | Filed under China, Really great shots and tagged with China.